Mas Amedda was a Chagrian male politician who served in high-ranking government roles during the twilight years of the Galactic Republic and helped establish and administrate its successor state, the Galactic Empire. 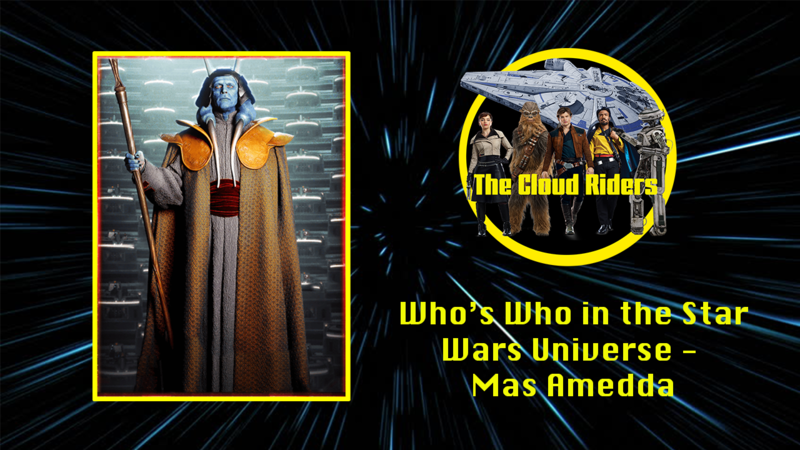 A native of Champala, Amedda was a talented political actor who filled the role of Vice Chair of the Galactic Senate of the Republic under two Supreme Chancellors on the capital world of Coruscant. His first chancellor, Finis Valorum, was ousted from the office following a Vote of No Confidence in his leadership during the Trade Federation’s invasion of the Mid Rim planet Naboo. Amedda weathered the change in administration and retained his post under Valorum’s successor, Naboo’s Sheev Palpatine. He became a close associate of Palpatine’s during his two terms in office and eventually became aware of the chancellor’s alter ego as Darth Sidious, a Dark Lord of the Sith intent on reforming the Republic into an autocratic state. Near the end of Palpatine’s second term, thousands of discontented star systems declared their intention to secede from the Republic, sparking the Separatist Crisis and creating a political atmosphere that kept the Supreme Chancellor in power. Amedda was instrumental in helping concentrate authority in the Office of the Chancellor at this time—efforts that culminated with the creation of the Grand Army of the Republic as tensions between the secessionist Confederacy of Independent Systems and Republic devolved into the galaxy-spanning Clone Wars. During the war, Amedda conspired with the Sith Lord to continue the unprecedented militarization of the Republic and marginalize the Senate’s role as a body of oversight and consent. Amedda managed the early stages of the secret mobile battle station project, which would ultimately produce the Death Star superweapon, whilst at the same time frequently opposing efforts by senators to push for peace with the Confederacy. At the end of the war in 19 BBY, Amedda stood with Palpatine as the chancellor used his authority to declare the Jedi Order enemies of the state and transform the Republic into the First Galactic Empire. As the Senate became an increasingly irrelevant body, the Chagrian transitioned to a new role as Grand Vizier of the Empire. In this station he oversaw a rapidly expanding military and civilian bureaucracy and served as the administrative right hand to the newly anointed and increasingly reclusive Emperor Palpatine. The Empire’s oppressive and abusive reign was eventually opposed by the Alliance to Restore the Republic during the Galactic Civil War—a rebellion that achieved its greatest victory in 4 ABY, when the Emperor and many other Imperial leaders were killed at the Battle of Endor. In the aftermath, Amedda was the highest ranking political leader in the Empire. With no control over the Imperial Military, the Grand Vizier was helpless as the New Order fractured and the recently established New Republic seized large parts of the galaxy. Amedda attempted to hold the regime together from Coruscant, but as the throneworld was roiled by civil war, military leaders like Counselor Gallius Rax and Grand Admiral Rae Sloane effectively took control, leaving the Grand Vizier stranded. After attempts at surrender and suicide Amedda was confined to the Imperial Palace by order of Counselor Rax until 5 ABY, when he escaped Coruscant and formally surrendered the Empire by signing the Galactic Concordance, thereby ending the Galactic Civil War. As part of the agreement, he was afforded continual rule on Coruscant as the leader of a provisional government, but under the surveillance of Republic overseers both Amedda and his administration were rendered powerless.